Protecting our natural resources through educated, concerned citizens. The Regional Conservation Committee are representatives from each of the Northeast Florida Audubon chapters who meet quarterly and have recently stated these Regional Conservation Priorities. Read more and sign up for alerts on the Audubon Florida web site. 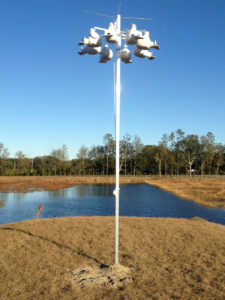 Thanks to a grant from Florida Power and Light, Alachua Audubon is the proud owner of a new pole camera! 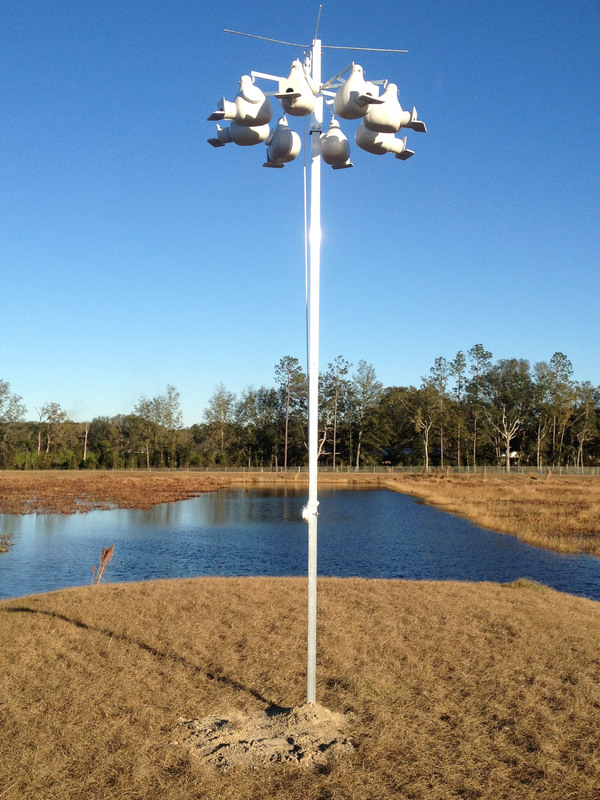 This device, which has a lens attached to the top of the pole and a display screen attached near the bottom, allows us to peek inside the 130+ American Kestrel nest boxes that we’ve put up all across north-central Florida in order to monitor the progress of the birds nesting inside. Earlier this month an Audubon group tried out the pole camera at a tract of conservation land in Suwannee County. You can share their discoveries in the attached photos. Read more about the kestrel nest box program on pages 14 and 15 of the January/February issue of the newsletter. Jay Watch -protecting Florida Scrub-Jays, our state’s only endemic bird species. Follow this link for information on Window Strikes and read about methods used to help prevent birds from colliding with windows. 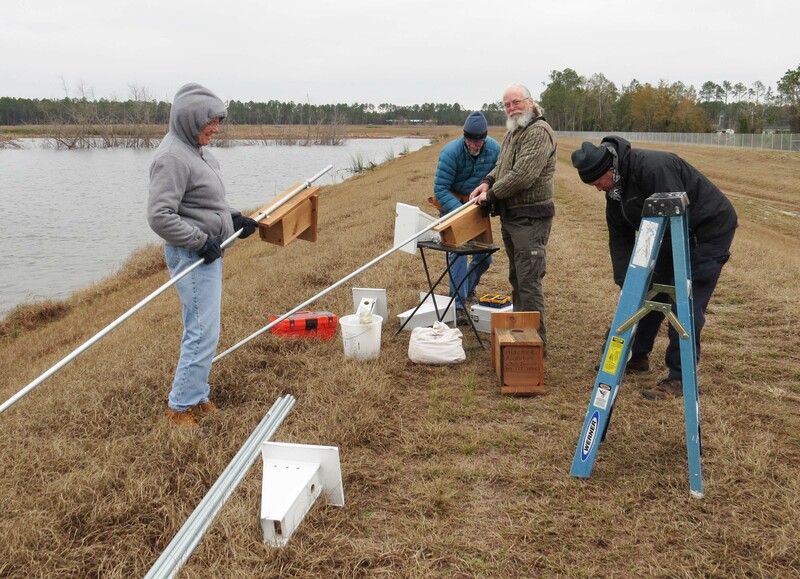 On January 13, 2018, several AAS members (Bob Simons, Michael Brock, Eric and Sherry Amundson, Johnathan Varol, and Debbie Segal) joined members of the Four Rivers Audubon to install six bluebird boxes, one kestrel box, and Purple Martin nest gourds at the Lake City Treatment Wetlands. It was a very cold morning but the camaraderie, scenery, abundance of birds, and satisfaction of contributing to bird conservation helped to distract us from thinking about our numb body parts. Read about the “first solar sanctuary“ from a partnership between FP&L and Audubon Florida. We would like to thank Bob Simons for his knowledge and expertise in this endeavor. American Bird Conservancy (ABC) – Alachua Audubon Society supports the American Bird Conservancy’s campaign, Cats Indoors! 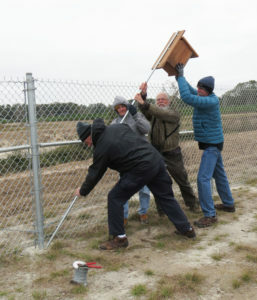 Creating Bird-friendly Communities is about taking personal conservation action to improve the environmental health and habitat quality of our yards and neighborhoods. Together, our actions can have a substantial effect. 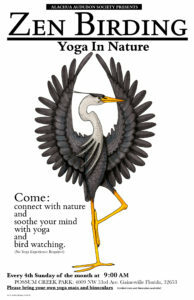 Plants for Birds is a program to help you get started in contributing to the welfare of local birds. Our backyards are our private spaces, but also part of a larger landscape we share with our wild neighbors. With the right tools and information, we can do simple things to create a healthier place to live for birds, plants, and other wildlife. Look into Audubon’s Native Plant database for a list of plants in your area that birds will love.